Q. 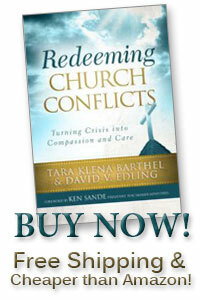 How can I maintain an “eternal perspective” given the harsh realities of this church conflict? Our call and our challenge is to apply what we both know and believe to be true from God’s revealed Word (His will) to every aspect of our lives; every trial, every suffering, every disappointment, and every conflict. Of course we still struggle to consistently practice what we believe in a manner that both mentally embraces and practically demonstrates a consistency of what I call “faith-belief-life.” If I truly believe that the greatest portion of my existence will be spent apart from my physical body and away from this temporal world, then shouldn’t that present belief also presently define how I deal with the harsh matters of this temporal life? Having tried to live as consistently as possible with what I believe, I confess, it is not always easy. (What an understatement!) Actually, I have found that it is impossible! That impossibility is what makes the Gospel “good news.” God has graciously revealed that it is not by human effort that I can rightfully anticipate a glorious future spent in an eternal paradise with Him forever. That is what faith in Jesus Christ has accomplished, but even more, I can rightfully now anticipate that thorough God-enabled and God-directed effort I can live in this present world as His eternal child. I can do that because he is all about conforming me, and conforming you, to his noble and eternal purposes (see Romans 12:2 and 2 Timothy 2:21). That reality should make a rather significant difference in how we are able to live day-to-day while still clothed in this flesh. Two practical elements of living from an eternal perspective are embodied in the biblical concepts of intentionality and contentment. These are practical terms and concepts that, for me, put content to eternal perspective living. Put into practice: whatever is true; whatever is noble; whatever is right; whatever is pure; whatever is lovely; whatever is admirable; anything excellent or praiseworthy (Philippians 4:8). Be diligent: receiving everything God created as good; rejecting godless myths; holding promise for both the present life and the life to come; setting an example for believers in speech, in life, in love, in faith, and in purity; devoting yourself to reading Scripture and to preaching and teaching; not to neglect your spiritual gift (1 Timothy 4). Do these things: make every effort to add to your faith goodness, knowledge, self-control, perseverance, godliness, brotherly kindness, and love; avoid becoming ineffective and unproductive in your knowledge of Jesus Christ; avoid becoming nearsighted and blind by forgetting that you have been cleansed from past sins (2 Peter 1). Learn to be content: whatever the circumstances; in need or in plenty; well fed or hungry; living in plenty or in want; learning the secret of being content by doing everything through him who gives strength (Philippians 4:10-13). Godliness with contentment: food and clothing are enough; rejecting love of money; pursuing righteousness, godliness, faith, love, endurance, and gentleness; fighting the good fight of the faith; taking hold of the eternal life to which you have been called (1 Timothy 6:8-12). Be content: by loving each other as brothers; entertaining strangers; remembering those in prison and those who are mistreated; honoring marriage; living free from the love of money; being content with what you have; remembering your leaders in the faith (Hebrews 13:1-7). When we know what practices we, as Christians, are to be intentional about, and those intentions are set within the context of contentment in our present day realities, we can have great hope and assurance that our efforts are God-enabled and God-dependent even as each day passes in this rapidly departing world. Intentionality and contentment reflect our faith in Christ, that He is subduing all things under His control. And even the tragic events we all experience take on meaning beyond their immediate consequences. Looking beyond the surface of our sorrows and conflicts, we are bolstered by the purposes that all life situations have. Purposes that are eternal purposes, rooted all the way back in the throne room and very character of God Himself. With our hearts fixed on eternity, we see beyond our daily conflicts (as difficult as they may be) and we fix our hopes on Jesus, the Author and Perfector of our Faith. God Himself is using all of our life events to mold us into his eternal children so that we will be useful both now and forever. Imagine! How our churches would blossom with gentleness, patience, joy, and peace if only more and more Christians began to consistently hold an eternal perspective of faith – belief – life. Of course there are many other Scriptural principles that call us to maintain an eternal perspective. I have shared two of my favorites with you, but I would love to know yours—and especially how you live your life in accordance with the verses that prompt you to live with an eternal perspective. When you come to a fork in the road take it! We will, Yogi Berra! We all come to many forks in our roads every day. Hour by hour, minute by minute, we can intentionally choose contentment as we apply all of our faith and belief to all of our life’s decisions. Or we can go the way of darkness and folly—never putting up the good fight of effort, of intentional trying. No. Instead, we choose to live miserable lives of rebellion against all we claim to believe, all we claim to have faith in. One path leads to life. The other, destruction. Choose (intentional, contentment-filled) life! This entry was posted in Authentic Relationships in the Church, Biblical peacemaking in the church, HOPE in the midst of conflict. Bookmark the permalink.